Don’t miss out on the chance to experience Xplor Fuego! On this exciting adventure tour you’ll enjoy a variety of fun activities that are sure to get your adrenaline pumping, like off-roading, rafting, ziplining, and more. First, you’ll drive amphibious vehicles through the rainforest to visit caverns, a crocodile pit, a waterfall, and two suspension bridges. Then, this night tour in the Riviera Maya continues with rafting along an underground river system that winds through subterranean caves, where you can admire ancient stalactites and stalagmites. 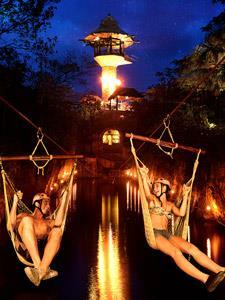 Afterwards, we’ll zipline along a softly lit path through the treetops overlooking the jungle canopy, and follow that up with a refreshing swim in the magical Stalactite River. If you love adventure, then you’re going to love this tour. Book your spot and get ready for an unforgettable night at this incredible eco-park in the Riviera Maya!